I’m glad someone stopped to look closely at the feathers there, or we’d never know that under those wing feathers is a multitude of hearts! It’s true for both Northern Flickers and Gilded Flickers. Look at the spots right above the tail; can you tell that they’re hearts? Note that the hearts are both on the side at the bottom, as well as under the tail. In this photo (courtesy of Nature’s Pic’s), you can get a much better look. Again, look at the white feathers near the tail. You can click on the photo to see an enlarged view. The flickers I encountered refused to lift their wings and pose, so I don’t (yet) have the photo I’m hoping for. Since I don’t want to steal someone’s copyrighted work, I’m sending you to cmlegere.com for a good look at the hearts on the feathers. It’s February, and even if the weather outside is no indication, spring is coming. Flickers will soon be banging their beaks against telephone poles, chimney flashing, and the wood siding of our homes—at 5 a.m. In turn, we will send them nasty thoughts and plot their demise. However, the next time you’re tempted to stick a shotgun out the window at a pesky bird, remember, killing (or even harassing) any native wild bird is illegal, with a hefty fine. 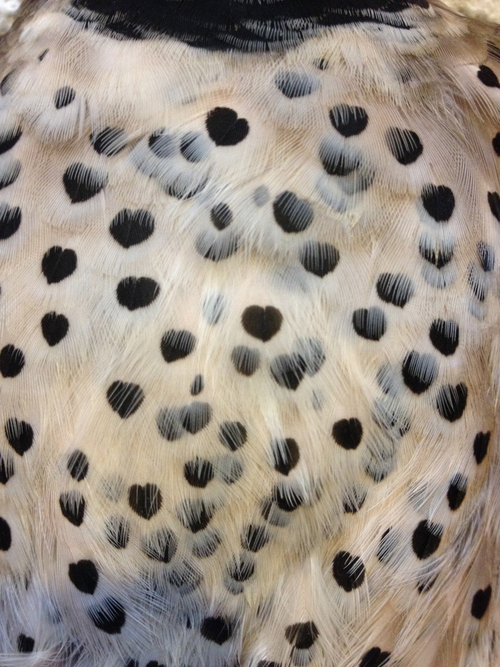 Besides, flickers can’t be all bad—they wear hearts! The answer to last week’s quiz was… Willet. Thanks Leslie! Cute! I will have to show this to my bird loving friend around the corner! !